Two billion years ago a meteorite hit the earth creating an enormous impact crater.This area, near Vredefort in the Free State, is now known as the Vredefort Dome. Vredefort Dome a truly unique, indeed mind-boggling site . It is 120 km south-west of Johannesburg and also it is the oldest astrobleme found on earth. 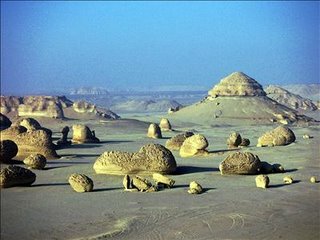 With a radius of 190km, it is also the largest and the most deeply eroded. It is said to have been created by a chunk of rock the size of Table Mountain vaporizing 70 Cubic Kilometres of earth on impact and a crater 300km wide. The Vredefort Dome is among the top three, and is the oldest and largest clearly visible meteorite impact site in the world. Vredefort's original impact scar measures 380km across and consists of three concentric circles of uplifted rock. They were created by the rebound of rock below the impact site when the asteroid hit. Vredefort Dome bears witness to the world’s greatest known single energy release event, which caused devastating global change, including, according to some scientists, major evolutionary changes. Vredefort is the only example on earth to provide a full geological profile of an astrobleme below the crater floor. The inner circle, is still visible and can be seen in the beautiful range of hills near Parys and Vredefort.Within the ring of hills found granitic gneiss rock. The force of the impact produced deep fractures in the underlying rock. Rock melted by the impact flowed down into the cracks, producing what are now exposed as ridges of hard dark rock - the granophyre dykes.The Vredefort Dome is a natural heritage site.When you visit the area you will find small hills in a large dome shape with beautiful valleys between them. Evidence has been found by geologists that the cause of this upliftment was an extreme impact event. Its mountains and valleys, the Vaal River bed, and many different climatic and soil conditions giving rise to a vast variety of different vegetations, exceptionally varied bird life, all this makes the Dome a very special place to live in and to visit. It was voted South Africa's seventh World Heritage site at Unesco's 29th World Heritage Committee meeting in Durban in July 2005. The dome is an all-year round destination, although in the winter months the cooler air and reduced vegetation make hiking easier.The nearby structure of the Dome to the north is very recognizable.You can enjoy hiking and bird-watching, Canoeing, rafting and fishing, camping, riding, mountain-biking and -climbing on the site. please note that the photo displayed is incorrect and not taken in the Vredefort Dome World Heritage Site. Thanks Warrin for your advice,we will work on it.